If you make any handmade items that involve knitting, crochet and even bags we can help, our labels are available in several sizes including common sizes such as 10mm and 25mm. Our labels are made from high quality materials including super soft double sided satin ribbon, they will not fade and are long lasting which means your labels will add a special finishing touch and provide important information such as e.g. your logo/brand name and wash care/social/media/re-ordering instructions for years to come. 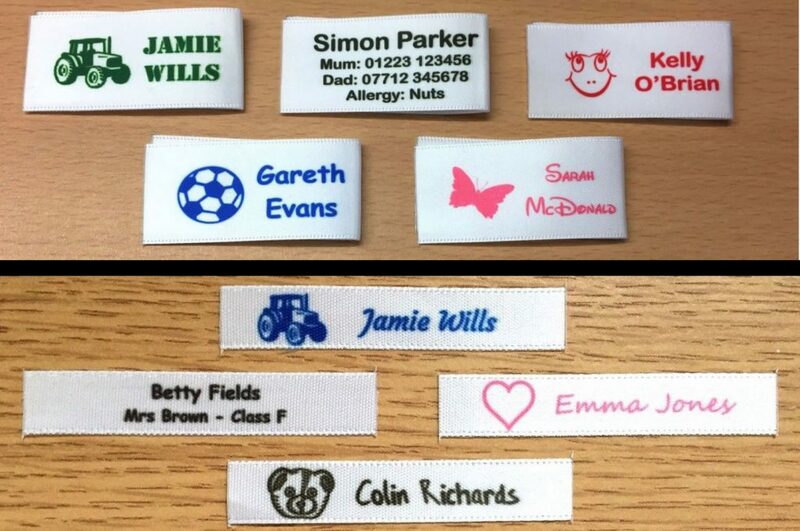 We are based in Cambridge UK and sell thousands of name labels to parents of both school and nursery children and also a wide range of care home name labels which can all be highly personalise and use our unique manufacturing process. Over several years we decided to switch from traditional thermal printing methods and adopt our own highly bespoke and unique method. This method fortunately allows us to produce in comparison to similar cheaper products very durable and especially important fade free labels, all of our labels as a standard can be personalised with 10+ fonts, 20+ solid print colours and 50+ optional motifs which are available in several categories including girls, boys, flowers, transport, sport and many more. Additionally we can also print in full colour e.g your logo as discussed above, of course you can just have as standard brand name in black writing on your labels it’s entirely up to you. All of labels are pre-cut and sealed to prevent fraying and this also saves you time when sewing them in etc. Ordering handmade labels for knitting, crochet and even bags is an easy process, basically you tell us what you would like printing and we will do the rest which includes if requested we can also provide a preview of your label design before starting the manufacturing process to ensure you’re 100% happy with what we have provided. We always save your design, if you decide to re-order we can produce the exact same labels for you which ensures consistency without your handmade items.